Several staff represented team Dupaco very well at the annual Iowa Credit Union Convention in Des Moines, Iowa, Sept. 16-18. Congratulations to the following staff for their willingness to step outside the box to learn, share, mentor, and grow professionally. Gregg Liddle received the prestigious 2015 Professional Cooperative Spirit Award in recognition of his outstanding service, commitment and leadership for the past 41 years in the credit union movement. Gregg delivered a heartfelt and humorous acceptance speech and received a standing ovation from conference attendees. 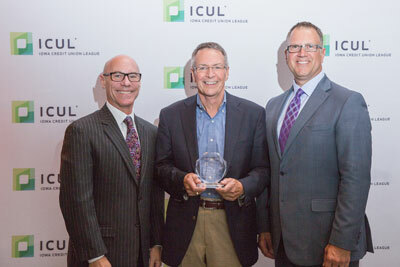 (Shown in the attached photo receiving the award from Iowa Credit Union League (ICUL) CEO Pat Jury (at left) and ICUL Board Chair Dave Cale from Financial Plus Credit Union in Des Moines). Gregg joins former Dupaco CEO, Bob Hoefer, who was a previous Professional Cooperative Spirit Award winner. Matt Dodds was sworn in as a newly elected member of the ICUL Board of Directors. With his service, Matt represents the collective interests and future of Iowa's 104 credit unions and their more than one million members. ICUL is the trade association for Iowa's not-for-profit credit union industry. Matt succeeds Dupaco's CEO, Joe Hearn, who served on the ICUL Board from 2006 through 2015. Jill Rothenberger was one of 12 credit union leaders selected to participate in the League's prestigious Iowa Innovation Group (IIG) program. The program was established to foster the development of new ideas and innovations for the credit union industry. As an IIG member, Jill served a six-month term, participated in periodic meetings led by a team from the ICUL and Filene Research Institute and was responsible for making a presentation to conference attendees to unveil her group’s project which they called CU AutoPilot. CU AutoPilot is an automated loan communication tool designed to enhance the member experience and create operational efficiencies. In true Dupaco fashion, Jill spearheaded the development of the concept and delivered an outstanding presentation on her group’s project which was the consensus favorite of the audience for its merit and practicality. Previous Dupaco IIG participants include Cedar Rapids' Market Manager Aaron Plein and Dubuque's Pennsylvania Ave. Branch Manager RJ Montes. Dylan Buls participated as a “Crasher,” one of 12 young credit union professionals under the age of 30 who had the opportunity to participate in the convention, attend special Crasher conversation sessions with industry thought leaders, and build relationships with other young credit union professionals. Near the end of the conference each Crasher also had the opportunity to relay to all attendees their thoughts on the program and Dylan spoke passionately about his experience. Previous Dupaco Crashers to the Iowa Credit Union League Annual Convention include John Heavens, Erin Engler, Leslie Biver, and Tammy Wood. Tammy Wood also was invited by the League and Filene Research Institute to attend as the “Crasher Mentor” based on her exceptional leadership, participation and volunteer “above-and-beyond” Crasher duties throughout the past year.